Let's face it: as wrong as it may sound, not everything will make it into hardcover! Even though we know it must be some diabolical plot or persecution, each hardcover junkie will at times have to cut corners and buy a trade paperback of their favorite comics when they know a HC is not in the offing. There's a veritable ton of collected editions material out there, and most of it is in the form of trade paperbacks. Not as sturdy or luxurious as hardcovers, no...but just as capable of delivering comics reading pleasure! 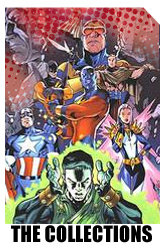 This section of the Marvel Masterworks collected edition library will allow you to browse the most current offerings of Marvel's trade paperback (TPB) publishing history. To your right is a series of lists, some of which are linked to live feature pages dedicated to the trades. Underneath this introduction is a list of upcoming Marvel TPBs. This page will add more and more content as time goes on. For another excellent list of collected editions, check out Rob Helmerich's TP LIST, an absolutely insane (in a good way!) resource website! Hope you dig this library page, and feel free to drop me an email if you would like to contribute any feebdack, ideas, or website content!